Dog Show Handling. The Ins and Outs. | DogJudging® - Il mondo della letteratura cinofila. 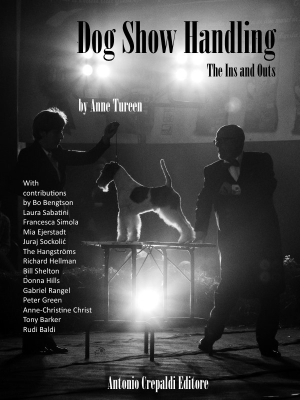 Home » News » Dog Show Handling. The Ins and Outs. The Ins and Outs of Handling offers a concentrated tour of the handling world. Voices of handlers from Europe and the USA, some famous, some not, will share with you how they came into handling, what they found there and what advice they would give you. A chapter explores basic concepts of how to rear a showdog and techniques to start handling that dog yourself. This is an entertaining text full of anecdotes and nuggets of wisdom, inspiring handlers both green and seasoned to be their best. The author was born in the United States, but lives and works in Italy. She breeds and shows Irish Terriers under the kennel name «Tuscan Red» out of her home in Tuscany. She writes a regular column «The Literary Dog» for «Best in Show» magazine and contributes articles on a variety of subjects to that and other publications. She is a qualified training instructer. Questo libro offre una panoramica dentro e fuori il mondo dell’handling, ossia l’attività di presentazione del cane in esposizione. Riporta le interviste fatte dall’autrice ad handlers europei ed americani, alcuni dei quali molto famosi ed anche giudici nelle più importanti esposizioni a livello mondiale. Esplora i concetti basilari delle esposizioni canine e le tecniche usate dagli handlers professionisti tra i migliori del mondo. Anne Tureen, autrice di questo libro, è nata negli USA ma vive e lavora in Italia. Alleva ed espone Irish Terriers con il proprio affisso “Tuscan Red”. Come giornalista cinofila cura la rubrica “The Literary Dog” nella rivista specializzata in lingua inglese “Best in Show” dove pubblica anche articoli su vari argomenti. È qualificata anche come addestratrice cinofila.